Dancin’ to the jailhouse rock tomorrow! My spies tell me that Ms. Monroe has written an original piece of jazz especially for the orchestra that they will perform on this day just for you. It’s our 10th anniversary and we’re doing two concerts again so there is absolutely no excuse to miss this traditional start to the Christmas season in Alaska this year! 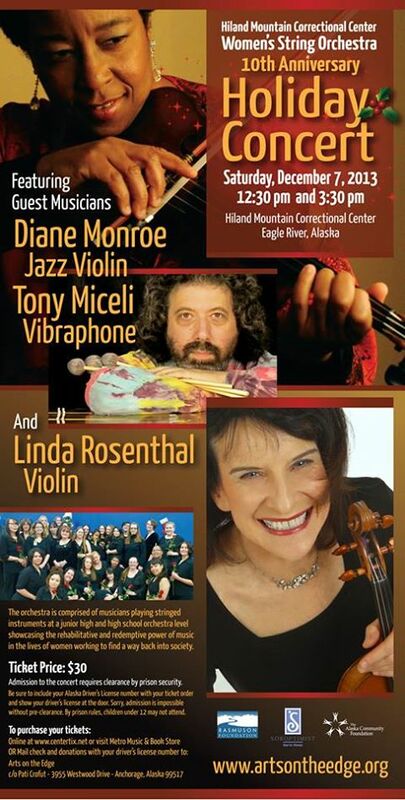 DIRECTIONS: Driving north toward Eagle River on the Glenn Highway, exit right at Hiland Road. Cross Hiland at the off-ramp sign and continue north on the frontage road about a mile to signs for the prison. VERY IMPORTANT NOTE: Admission to the concert requires clearance by prison security. Be sure to include your Alaska Driver’s License Number with your ticket order and show your driver’s license at the door. Sorry, admission is impossible without pre-clearance. By prison rules, children under 12 may not attend. If you have any questions please contact Pati Crofut. I would if I could, but I do live in Iowa.